This one is for the lovers, the mushroom and the garlic lovers. This garlic mushroom bruschetta is all I want for Valentine’s day! I could live forever on just this. This is no ordinary mushroom bruschetta, my friends, no, this Mushroom Bruschetta is extra. Extra mushrooms, extra garlic and hey, have that extra bread if you want! Now, there are a few tips in here, this is not just any old mushrooms on toast! So you really don’t want slimy mushrooms on limp skinny bread. This is an indulgent appetiser or lunch if you want. You need to use good bread, one or two days old sourdough bread is perfect. You also need to use chestnut mushrooms, these will give you that rich brown result. How much garlic you use is up to you. One fat clove of garlic will suffice for rubbing on the bread, two fat cloves in the mushrooms are perfect but if you want to add more then that’s up to you. First of all, you need to wipe those shrooms clean. Do not wash them, you can use a brush if you want. Next, you need a large, hot pan, so place your pan on the hob and turn up the heat. Drop the butter into the pan, it should sizzle straight away. Once the butter has melted and is bubbling up into a foam, add a handful of the mushrooms to the pan. Don’t overcrowd the pan. Don’t stir the mushrooms, carefully tip the pan up to toss the mushrooms. Once they are done move them to one side of the pan and repeat for the rest of the mushrooms, one handful at a time. That’s it, no slimy mushrooms, no pan full of liquid, just golden brown perfect mushrooms. Follow the step above on how to cook perfect mushrooms then very near to the end of cooking add in the garlic and thyme, give the pan a quick stir and cook for two minutes. Season with salt and pepper to your own taste. 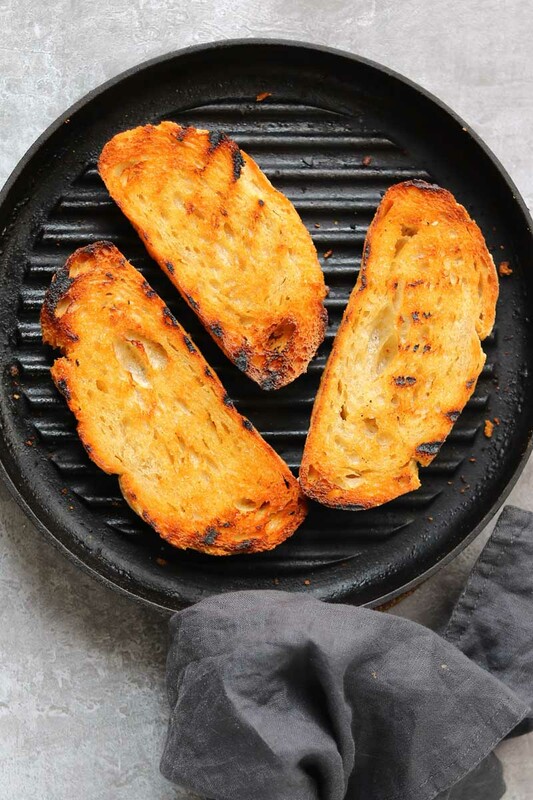 I toast up my sourdough in a hot griddle pan, this is quite quick, however, you could toast it under the grill if you like. Once the bread is toasted rub a clove of garlic all over one side of the bread, how much garlic you use is up to you. I usually end up using the whole clove. Next tumble the mushrooms over the toast, sprinkle over the parsley and you are done! Perfect garlic mushroom bruschetta. Garlic mushroom bruschetta. Perfectly cooked mushrooms on toasted sourdough. Perfect for mushroom lovers, this is a tasty appetizer or lunch. Heat the pan over a high heat. Drop the butter in the pan and once it bubbles up add a handful of the mushrooms and cook for a minute or two. They should brown quite quickly. Move those to one side of the pan then add another handful of mushrooms. Repeat until you have added all the mushrooms. When the mushrooms are cooking toast up the bread. Drizzle half the olive oil over one side of the bread then place the bread on a hot griddle pan. Repeat for the other side. When the bread is toasted rub one of the garlic cloves all over one side of each slice of bread. Once the mushrooms are almost done add in the thyme and the garlic, cook for a minute or two. Season the mushrooms with the salt and pepper to your own taste. Tumble the mushrooms over the toasted bread and top with the parsley. Serve immediately. Calories are approximate and are based on just the mushrooms! I recommend using chestnut mushrooms for this but you could use white button mushrooms instead. Please be aware you won't get that lovely brown colour though. This is really easy to veganize, just switch out the butter for vegan butter. I don't recommend freezing this. How much garlic you want to use is up to you, for us 3 fat cloves was enough. 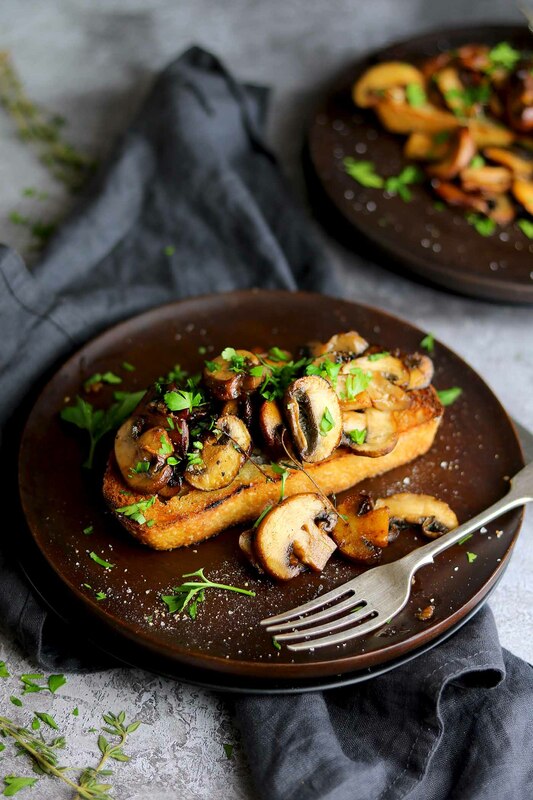 My family loves Mushrooms and loved this amazing recipe of Mushroom Bruschetta. Looks so flavorful and delicious. 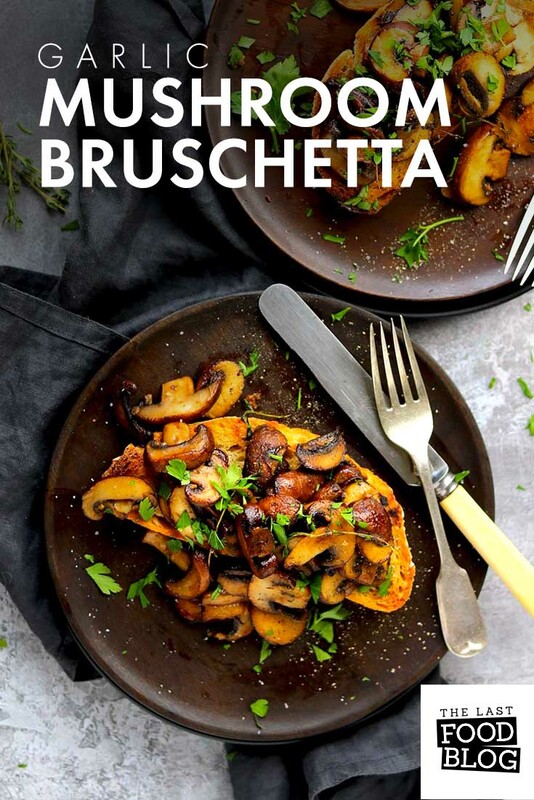 I am a huge mushroom fan and this bruschetta is such a delicious looking way to enjoy them. I love that it just allows the mushrooms to shine on their own. Can’t wait to make it! Sounds like a delicious way to change up the traditional bruschetta. I would love this! My mouth is literally watering! Haha omg this looks fantastic! That beautifully toasted bread alone is making me swoon over this dish. I love your version of bruschetta and have to try it soon! This looks so good! The meaty mushrooms make this for a nice and filling meal for meatless Mondays. This looks great! These bruschetta would make a nice, light dinner with a side salad too! Pinned for later. Thanks! You make me want to love mushrooms! Your photos are amazing! Wow, this bruschetta looks amazing! Loving the flavor combo you have put together. This would have been perfect for the super bowl, but pinning to make for my next dinner party instead! Such a beautiful photos. Looks absolutely delicious. Makes me wanna grab that bruschetta right of the screen. This is something that my hubby would like very very much. So I’m saving this recipe to surprise him when he comes home from business trip this week. He will be delighted. Garlic and mushroom?! Enough said. I’m over here drooling. Love this variation of traditional bruschetta. This is definitely being added to my recipes to try ASAP line up. Thanks for sharing!